This is a healthier way to serve eggs to your family on week ends with a refreshing smell of dill & spring onions. 1/2 bell pepper chopped (red will be better) if not possible then add 1 chopped seedless tomato. salt & pepper to adjust ur taste. With a beater beat the eggs for 15 min (this will make it nice and fluffy). Add in all the ingredients except the cheese. Now beat with a fork. Add the cheese & mix. Apply spraying oil on a parchment paper or foil over an 8"x 8" dish. Pour the eggs over it & bake in 450 deg for 20 min or until set. Remove from oven, allow to cool for 10 min then cut into desired shapes. Thankx Fatima for ur suggestions , I do add diff things 2 my recipes every now & then 2 give them new tastes. Hi RABZ, nice recipe! 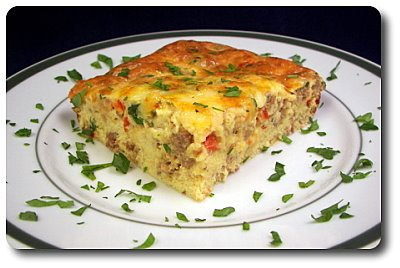 This Omelet can also be baked in a cup cake tray. Pour the mixture into moulds, top it with cheese and bake. Also can add sausages and boiled macaroni-rice shape to it. Thanks Priyanka, @Sonali, Shredded( kadu kasht) cheddar & Mozzarrella r types of cheese. As for cream u can use fresh or can cream it is up 2 u.Hope tat helped. Cheers. hi rabz very nice recipe and a good option 4r breakfast. Sorry but the dill is 2 tbsp not 21 tbsp. Cheers.